Fight flu season one bowl at a time. Flu season is upon us, but that doesn’t mean you have to suffer. Rather than wait for the first symptoms to show, stock your pantry with immune-boosting ingredients like garlic, ginger, and turmeric, and call on a roster of recipes that incorporate the superfoods. If you’re already feeling sick and worn-down, we’ve done the reserach for you. Ahead, we spotlight 10 homemade meals are packed with vitamin-rich veggies and scientifically proven immune-boosting ingredients, meaning they’re perfect to enjoy when you feel “under the weather.” Add these immune system-boosting recipes to your shopping list to ease a cold or make it through winter in great health. Not only does this soup contain one of the healthiest ingredients on the planet, it also tastes pretty amazing. Broccoli is rich in anti-inflammatory compounds that help keep your body in balance, including your immune system. Combine that with aromatic leeks and melted cheddar cheese, and you can truly indulge in this recipe. Bone broth has become quite popular in the health food space. Why? Because it contains amino acids to help reduce inflammation and collagen to restore gut health. It’s also extremely easy to make and can be used as the base for most delicious soup recipes. Now here’s a recipe that doesn’t skimp on veggies or flavor. Packed with the cold-fighting ingredient ginger, this root contains natural antioxidants that have been used for centuries to aid in better health. It doesn’t stop there: This soup is also full of beta-carotene from carrots and sweet potatoes, which aids in the production of Vitamin A in the body, improving eye health, glowing skin, and of course a stronger and healthier immune system. This is one powerful soup! The name of this soup says it all. Each ingredient in the recipe boasts a benefit to the human body. From the anti-inflammatory spice turmeric to the Vitamin C-rich Bok Choy, this is definitely a nutritious soup we can get behind. For thousands of years, people have used and praised the disease-fighting benefits of garlic. In addition to its superfood qualities, when roasted it smells and tastes heavenly. Pair it with pureed cauliflower, and you have a light and easy meal you can feel good about. If you love your soup with plenty of exotic flavors, then this one’s for you. 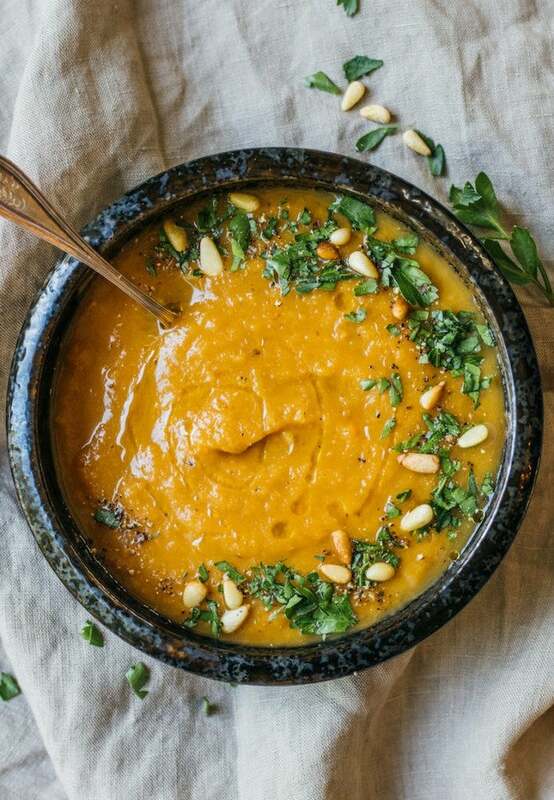 The pureed carrots and coconut milk give it a beautiful, rich color, and the added spices offer an enticing scent and plenty of health benefits. One of the ingredients, coriander, has been known to lower cholesterol as well as aid in stronger bones. In just one hour, you can have this beautiful bowl of comfort food. Not only does it look vibrant, it’s full of green vegetables that will make you feel amazing. Kale, leeks, garlic, and apple cider vinegar are just some of the health-conscious ingredients showcased. Keep this recipe on hand for the next time you feel a sniffle coming on. Skip the lemon water, and try this lemon chicken soup instead. Not only do lemons have antibacterial properties, they can also help in lowering fevers. When mixed into the soup, the tart juice adds a nice touch to the salty broth and creates a wonderful and refreshing aroma. There’s nothing better than a warm bowl of chicken noodle soup when you’re sick, but is there science to back up the health benefits? There sure is! The soup’s salty broth keeps mucus thin the same way cough medicines do, and the warm liquid eases the pain of a sore throat. Grandma was right after all. If you really want your body working at optimum speed, reach for zinc. Even better, reach for foods with zinc, like oysters. This soup combines the flavor or oyster meat with artichoke hearts for a wholesome and tasty result.